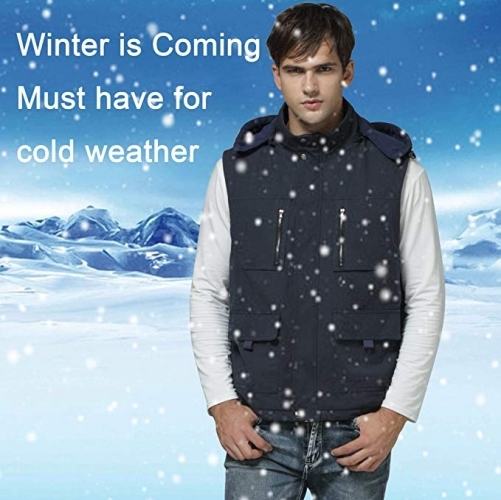 The rechargeable vest is lightweight and breathable,to keep you warm and comfortable. For those extra cold days, Carbon Fiber fast heating up, keep you warm without a bunch of bulky and heavy layers. Heat Setting:3 Levels Temperature Setting- High (Red), Medium (White) and Low (Blue). Your Heated Vest can be ready for use in just a few easy steps. 2.Press the controller in the left chest for one second.The light comes out and the vest begins to work. 3.Press the controller to adjust different temperature setting.Press one second for off. Incredibly lightweight, warm& comfortable, you can say Bye Bye to a bunch of bulky and heavy layers in the cold!